Hook timing is a fairly common problem that sends many sewers running to the repair shop. When it happened the first time on my older Kenmore, I decided to try to repair it myself first. My thinking was, since it’s a mechanical machine with mostly metal parts, as long as I was careful, I couldn’t really hurt anything. I probably would have thought twice before attempting it on a computerized machine. My sewing machine needed the hook timing adjusted because my walking foot vibrated the needle loose and I hit it. I could have taken it to the shop, but I chose this route instead. Scary! All machines are a little different, so what worked on mine may not work on yours. Something I recommend to everyone who wants to work on their own sewing machine, is getting a copy of the service manual. Honestly, I still need to do this. There’s tons of info online, but having the actual service manual is even better. You should have an owner’s manual on hand, too. It covers basic care and maintenance. For repairs, though, the service manual will give you technical instructions and confidence. Before taking things apart, determine if hook timing is causing the problem. If the needle (top) thread isn’t picking up the bobbin (bottom) thread, hook timing is a prime suspect. It’s always a good idea to rule out simple problems first, though. Try swapping the needle, rethread the machine and sew on some scrap fabric. If it’s been a while since you’ve dusted the lint out of the bobbin case or you’ve been sewing on linty material, give it a good cleaning. Once you’ve tried the easy fixes, if it still isn’t working right, look at how the needle and the bobbin hook intersect. This page, https://tv-sewingcenter.com/general/sewing-machine-timing-hook-timing, has illustrations, photos and descriptions for where they should meet on both rotary and oscillating machines. Taking a look at my oscillating hook. My machine is an oscillating machine, so the hook tip should pass just above the eye of the needle. Mine was passing below the needle’s eye, so clearly the hook timing needed adjustment. The first and honestly the hardest step was figuring out where all the screws were that I needed to remove to take off the casing. (Actually, the first step was to turn off and unplug the machine. If you’re attempting this at home, do not skip this step!) On my Kenmore, I have to take off the side by the hand wheel, a plate on the bottom, and the front panel. While I have my machine open, I like to take the opportunity to clean it out and oil it. Oiling a linty machine, using the wrong oil or putting it in the wrong places can cause tons of problems, though, so if you’re not sure, stick to dusting only. Next, I tilted the machine on to it’s back so I could get a good look at the mechanism that rotates the hook. Once I had isolated that, I found a hex head set screw. Loosening that allowed me to gently adjust the hook position so that the tip passed just above the needle’s eye. About in the middle, just above the motor is a silver piece with a round, black screw near the top. That is the set screw I loosened to adjust the hook timing. When I was sure I had it properly positioned, I tightened the set screw. I turned the hand wheel a few more times, making sure everything still looked good before I put the casing back. A quick test run showed everything was working properly again. It’s so satisfying to be able to make simple repairs to my machines myself, especially when most repair shops start around $75 and go up from there, depending on what needs to be done. In keeping with my desire to be more conscientious with my clothing, I shopped my closet for clothes that aren’t bad, but need a little refashioning to make me feel comfortable in them. I’ve had this gauzy tunic top hanging in my closet for a while. It felt nice and lightweight, but I just never felt like wearing it. Originally it was a pale, pastel blue. I thought maybe a color change would help, since I’m not big on pastels. I added it to a black Rit dye batch a few weeks ago, turning it a nice, dark grey. When I put it on yesterday morning, though, it still wasn’t quite right. The sleeves had weird cuffs sewn on that were an awkward length and oddly tight. I decided they had to go. See the blue thread? That was the original shirt color. Rather than ripping out the seam, I simply cut away the cuffs as close to the seam as possible. I could have folded and hemmed the sleeves, but I planned to wear the tunic that day, so I wanted a quicker way of finishing them. Instead of hemming, I used my serger to make a rolled overcast edge where I had removed the cuffs. Not only was this quick, it gave the sleeves a light, breezy feel that, in my opinion, fits better with the overall style of the shirt. With the new color and sleeves, I can see myself getting much more wear out of this tunic shirt. Lately Christopher and I have been talking a lot about fashion. It started as a discussion about not being able to find comfortable clothes and how hard it is to find clothing that goes against the trends. Being crafty, we explored making our own clothing. The cost of fabric, supplies, time it takes to cut and sew all highlighted how impossible it is to produce clothing ethically at the low prices charged for much ready-to-wear clothing. That doesn’t even take into account the raw materials that are used to make the fabric and problems with content, pesticides, sustainability, etc. At the same time, like many, our budget, doesn’t allow us to spend a ton on clothes. We try to make the most of our clothing budget guilt-free by shopping thrift stores and second hand shops. That way we aren’t adding to the problem by purchasing new. Most thrift shops are charity-based, so our purchases help others. We often find better quality items than what we would otherwise be able to afford this way, too. With thrift shopping, you’re not as limited by trends. If you’re looking for something in particular, unless it’s a common item, you’re still likely to come up empty handed. That has been our problem when it comes to comfortable men’s and boy’s pants. Both Finn and Christopher would prefer something a little roomier, like karate gi pants. Unfortunately, nothing like that has been in fashion since M.C. Hammer. That means it’s time to put my sewing machines to use. This summer, I started by trying to copy a pair of the cotton knit gym shorts they practically lived in, adding a gusset for comfort and mobility. I used to buy bulk bags of t-shirts from Thrift Town before they closed, so instead of using new fabric, I used some XL t-shirts I had on hand. That way, if things went horribly wrong I wouldn’t feel as bad. If you follow me on Instagram, you might remember seeing this photo with some enticing caption like, “Working on a new project!” Then, nothing else was said. Sorry. I have zero experience with pattern making, so this was a learning experience. Here’s a brief overview of how I did it. I laid the shorts inside out and folded in half, front to the inside, smoothing them as flat as possible. Then I traced them, adding about an inch all around. The inch is for seam allowance and to account for the fact that it’s impossible to get finished shorts to lay flat. I always err on the side of too big, because that is much easier to fix. At the waistband, I measured the waistband and extended the pattern by that amount plus seam allowance above the waistband. This allows it to be folded down for elastic and a drawstring casing. At the hem, I extended the lines two times the width of the hem to allow enough fabric to fold and hem. On the pattern, I drew lines straight across to show where the finished hem and waistband hit on the original shorts for reference. Then I folded them in half , backs to the inside and repeated the above steps since the back is cut differently than the front. For the gusset, I drew kind of a triangle with the top point cut off. To do this evenly, I folded a piece of paper in half, drew a half inch line perpendicular to the fold, moved over about four inches and drew another perpendicular line measuring one and a half inches. Then I drew a straight line connecting the tops of the lines. I cut along the lines and opened it up to get my gusset pattern. Sewing the gusset in with the wider part at the crotch seam and using a half inch seam allowance results the gusset tapering down to a point. Shorts work for summer, but I needed to come up with a pants pattern for fall and winter. Chris suggested just making the shorts pattern longer, so I did by measuring the waist to floor measurement and extending my pattern the needed amount, including seam allowances. I did this by taping the bottom of the pattern to a big piece of paper, sketching out the needed length and side seams and cutting it out. My pattern isn’t perfect. I think I’ve tweaked it each time I’ve used it. Since the pants are made to be loose and flowy it hides the imperfections. These are my first attempt. I made them with a linen blend, elastic and drawstring combo waistband and no pockets. I added side-seam pockets later. My goal is to find or draft a few more basic, customizable patterns for pants and shirts that can be made in linen or a similar material. Then I can buy a bulk amount of undyed fabric and dye it as needed. I have a pair of denim blue jeans that are still in good shape except for where my thighs touch. There they are really worn on one side and there is a hole on the other. Because of where the hole was located, I wasn’t comfortable even wearing them around the house, so I decided to try a simple fix. First, I ironed lightweight fusible interfacing on the inside of the worn areas, making sure to completely cover all the worn out spots with the interfacing. Once it was fused and cooled down, I turned them right side out. Using a narrow zig-zag, I stitched back and forth over the hole and worn areas. This serves to secure the interfacing and add strength. If you can, drop or cover the feed dogs on your sewing machine in order to be able to move the jeans freely under the needle. The machine I used doesn’t have a way to drop them and I don’t have the special foot plate to cover them. Instead, I used a combination of repositioning and forward and reverse stitching to make it work. Depending on the location, you could use contrasting thread and decorative stitches to turn the repair into an embellishment. I also have a pair of jeans I love, but they needed a button sewn back on. They were also always a little short, so I replaced the button and let out the hem while watching TV one evening. 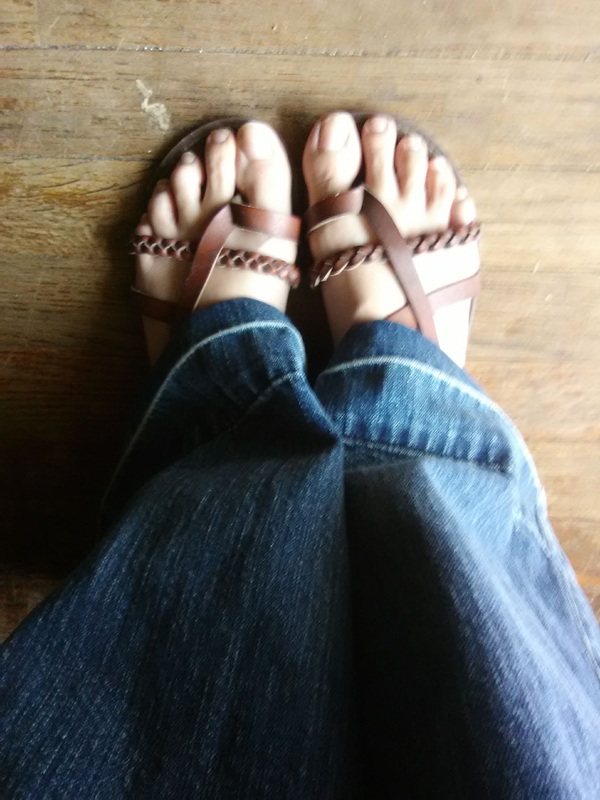 These are heavier denim, so it will be another month or two before I can wear them much, but at least they are ready. These have an obvious line where the hem used to be, but they’re cute so I don’t care. This morning I made a messenger bag using Merriment Design’s Kid-sized Messenger Bag Free Pattern and Sewing Tutorial. The size is also nice for a small messenger-style purse. Her tutorial is awesome, so I’m just going to share the minor change I made. Instead of making a fabric strap, I used some webbing I had on hand. Not only did that save time, but it allowed me to make the whole thing with two fat quarters. You could also use a thick ribbon, upcycle an old belt or an old purse strap for the handle. I like using a light colored fabric for the lining in most bags I make. It makes it easier to find whatever is inside. The fabric is from a fat quarter bundle I found at Tuesday Morning. I always find fun things in their sewing and craft section.